Summary Intel Celeron based two-bay NAS supporting many network services. Unless you are a long-time reader of our NAS reviews, you probably won't recognize the name Noontec and its TerraMaster brand of NASes. 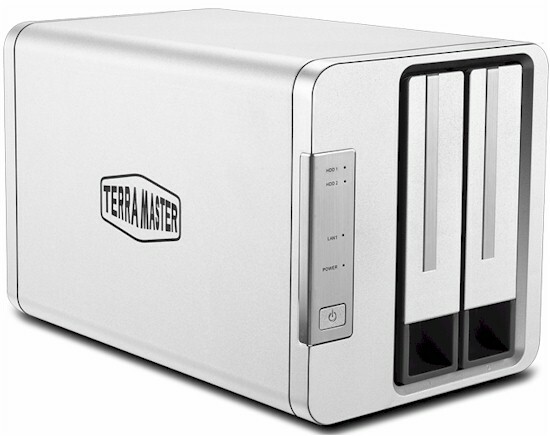 Our last review of a TerraMaster product was the TerraMaster F2-NAS in the spring of 2014. This review looks at the Noontec TerraMaster F2-220 2-bay NAS. It features a more powerful dual-core Intel Celeron processor and more memory than its predecessor, but is priced the same, around $180. For comparison during the review, I selected two lower priced two-bay RAID 1 class products - the $128 ZyXEL NAS326, and the $175 ASUSTOR AS1002T. The chart below, generated from the NAS Finder, compares key product specs. If you want to see the full comparison of features, click here. What's important to note here is that the TerraMaster has a dual-core Intel Celeron J1800 and 2 GB of memory. The other two NASes are based on single-core Marvell Armada 38X processors and only have 512 MB of memory. We'll see how the differences in hardware impact performance later in the review. The callouts below show the front panel, LED and buzzer descriptions. The rear panel of the F2-220 is so simple I didn't include callouts. It has a power socket for the external brick power supply, a single Gigabit Ethernet port, a USB 2.0 port and a USB 3.0 port. The USB 3.0 port has the standard blue plastic insert found on all USB 3.0 ports. Two Western Digital Red 1 TB (WD10EFRX) drives (SNB supplied) were used for testing. Total power consumption with all drives spun up was 14 W (drives active) and 8 W (power save). Fan and drive noise was rated very low. The image below shows the component side of the main board. In the top left, there's a connector for the drive backplane. In the lower left corner, marked USB1 is the USB slot for the flash drive. (See component summary below). Below is a photo of the board bottom.. Note the SODIMM memory expansion socket on the left side of the board. Memory is expandable to 4 GB total using this connector (RAM type: 1600/1333MHz DDR3L 1.35V). The key components are summarized in Table 1 showing the TerraMaster F2-220, ASUSTOR AS1002T and ZyXEL NAS326 for comparison.